Systems thinking is a management discipline that first observes discrete functions and interactions between components. In education that would be the interactions amongst teachers, learners, administrators, digital content and learning goals. Systems thinking then uses that data to derive a useful construct, a system, that creates efficiency and utility for all. Sometimes this system is multiple systems of multiple functions. What is happening right now nationwide in the transition to digital by schools is considerable confusion, overlap, and inefficiency at the software and content level. A majority of tech transition constructs by schools are piecemeal documents and a patchwork of apps. Many times, these are wonderful but isolated islands of teacher-driven ingenuity, with little or no over-arching system tactics. It’s time to have Systems Leadership. Today’s school leaders need to understand what it means to program a computer, to harness an automatic technological workflow. This is “systems thinking” and is at the core of what currently drives the economy. Being able to harness machines to do the heavy lifting of the institution is a very different reality than leaning only on people. This does not mean teachers will be irrelevant, it means all school staff will be highly leveraged. The leadership of today thinks first of how to get the problem automated by some technology, then how to organize and array human components. This is the giant leap forward for education as it moves closer to the business enterprise model. For five generations, the span of attention of school leadership has been focused on the basics of the Industrial Age: buildings and grounds, staffing, goal-setting, curriculum-as-raw-material, and managing the schedules. A well-wrought software technology stack, built into a complete “software house” for the institution, creates highly synced efficiencies and flexibility. It has the capability of replacing the existing structure with a digital “un-structure” for every element of the past, and yes, including teaching-on-demand over the internet when a substitute or expert is required. Systems thinking was defined in Systems Thinking Basics by authors Virginia Anderson and Lauren Johnson as a big-picture view of the whole. Districts and schools should not only recognize the interconnections between their operations digitally and their methods of educating via teachers and screen learning, but they must work to unify all of it together. Call it “Blended Administration” to mirror the classroom “Blended Learning” trend, a higher harmonic of technical sophistication. This is the ever-changing shift education has entered with the incursion of more technology. At issue is the ability to see the software systems orchestrating a whole. When leaders are not familiar with the qualities and quantities of information or software development, and how that information serves to run the organization, not just serve users, they tend to let everyone decide how to use technology in a giant free-for-all. This results in activities where the same 6th-grade lessons are different teacher-by-teacher, which might be great for them as teachers, but in terms of results, the school is now looking at unpredictability for channeling customizations. Additionally, teachers doing a whole lot of document-based and video-based lesson planning, even with simple workflows and assignment envelopes, are not necessarily creating highly engaging learning because they are not animators, coders, or digital instructional designers who can craft great user experiences. Personalization gets further distant because the act of having to build so many topics reduces the customizations in home-grown digital lessons. Another dimension of awkwardness happens when teachers, from one class to another, use different apps, different log-ins, and different metrics such that students from one hour to the next are overwhelmed by technical, non-educational elements. The cost to learning is high. Worse, the set-up to protect and allow the classroom to silo and be its own island of learning with that teacher, immobilizes real transition to true personalization. The cost of not transitioning to a managed systems view is incalculable. The capability and efficiency of systems management is the actual promise that tech brings. Schools and teachers err where they only consider tech is something to have students get a basic understanding about, or something to provide niftier lessons. It’s a ubiquitous tool, a delivery mechanism, organizer, and point of analysis to master a fantastic level of learner service. Change outside of education is happening more rapidly than inside, and it is happening largely through infiltration of technologies. As technology offerings multiply in education, leaders need to first know the issues with all of it. There are un-system “solutions” that will do more to disperse files and wreck institutional continuity than were ever possible in the paper and textbook days. This is because when leaders just “let” rather than “cause” institution-wide technology solutions, they are not systems thinking. Letting teachers and students file documents and identities any-old-where in any-old-schema, leads to a digital mess. Leaders must consider that some cloud solutions are simple for teachers to use, but the filing construct is totally teacher-centric. It’s also potentially risky for institution and student privacy. Unless you have access to their system root keys and can code sniff what fields they are collecting, you’ll never know if what they say in legal documents about “not collecting” or “will never use” is really true. It’s intensive work to turn off field collection for some users and not others in major consumer systems, and once a student turns 13, or at 18 matriculates out of your system, all the data on them could be “fair game” to use commercially. Contracting language with those providers is very important. There are millions of digital learning objects and apps, the digital bits of things that can be aggregated into lessons. “Free” is not free when it capitulates software sophistication and takes hours to find. There are thousands of automated courseware and digital learning object providers to take a lot of the lesson-planning burden off teachers while adding enormous value. 75 or more log-ins per classroom leads to tens if not hundreds of hours of lost productivity time when all students can’t get to materials. There are many single-sign-on solutions out there. Lack of messaging interchange and visibility to what students are doing results in non-personalization and is a risk to learning. There are hundreds of various software systems for different tasks. A few are trying to be the total solution. When implemented, leaders must ensure massive onboarding training to ensure use or the “total solution” falls away into waste. There are risks in security, in privacy, in copyright liability, and just plain software that doesn’t-work-in-the-digital-transition journey because it’s clunky. Sixty percent of all materials should be digital, with the remainder the non-digital manipulatives, community activity technologies like interactive whiteboards, and lab resources. Learning Counsel advises that schools target forty percent of individual learning time is to be used in digital curriculum for reading and interactive personalized lessons on all major subjects, with the other sixty percent of time in individual and group activities built around that by the teacher. This is the efficiency transformation. Look for the next installment of this article in next week’s Learning Counsel newsletter, published every Tuesday morning. 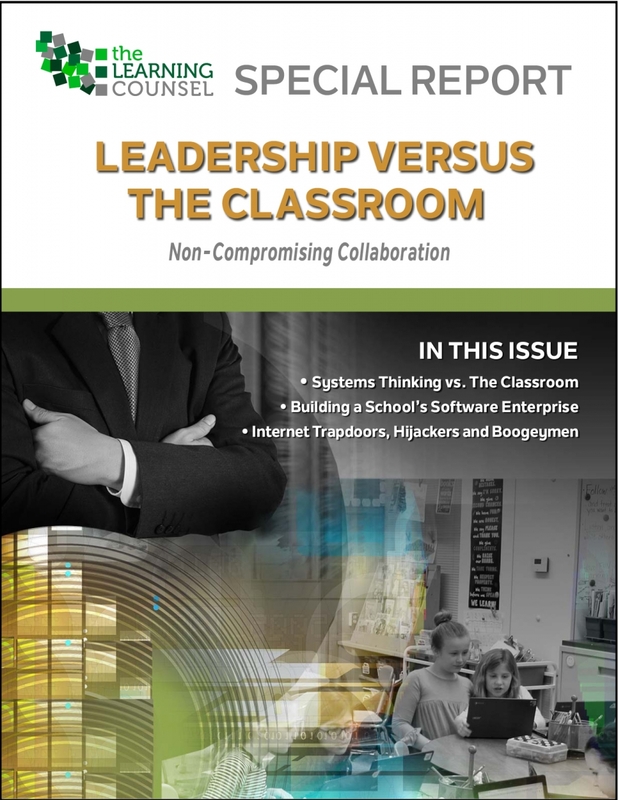 The complete article, including spotlight interviews on education leaders are included in the Leadership Versus The Classroom Special Report. Download it here.